NEW in South Africa is SmartCat All Natural Litter, which is made from 100% renewable grasses grown in the USA. It is chemical free, GMO free, biodegradable and has no added perfumes or fragrances that could be off putting to cats. SmartCat All Natural Litter is virtually dust free. With no dusty residue, the chance of litter related respiratory issues is greatly reduced. It also has a paw soft sand-like look and texture that most cats accept readily. 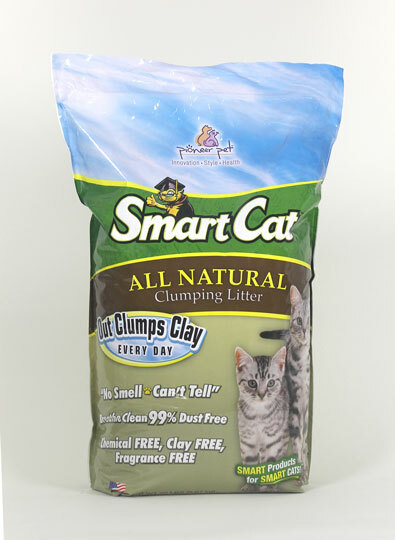 SmartCat All Natural Litter clumps on contact by immediately and completely absorbing urine. This quick clumping action traps the odour-causing bacteria, and odours disappear. Clumps will continue to harden and dry until all liquid is absorbed, forming a rock hard clump that is easy to scoop and flushable. SmartCat All Natural Litter works well on faecal odours too. Your litter box can now stay clean and odour free for longer! And it is half the weight of traditional clay litters!